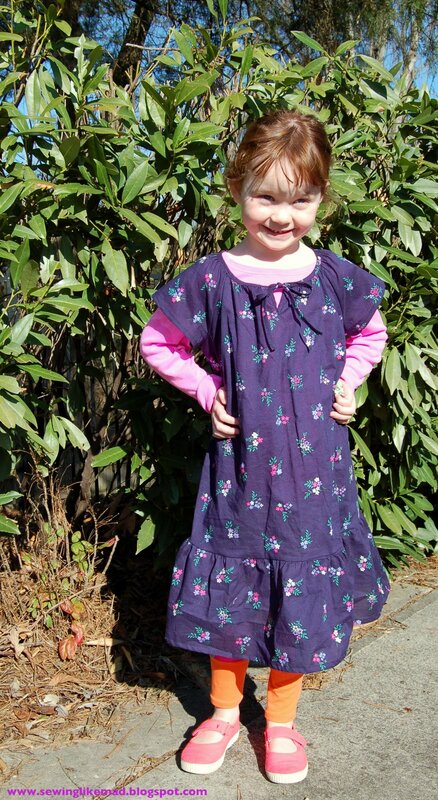 Sewing Like Mad: My first dress from a Japanese pattern book. My first dress from a Japanese pattern book. Well, I did. I read every detail in every post because I had just ordered my two first Japanese sewing books. I first got introduced to one last summer by my very good friend Rikke and later I have seen several very cool styles here in the blogosphere, fx at Sew Country Chick and you & mie and I loved the simple yet cool styles I saw. BUT also extremely intimidated by the Japanese. SO when Cherie (from you & mie) announced her series I ran to my computer and ordered two books. The series ended this friday and I made this dress this sunday. Yes, I was pumped and ready to go. And here I am with the result. W choose the model...well, actually she choose a different one with long sleeves and my plan was just to shorten them but then I realized the same model but with short raglan sleeves was there too and I made that instead....she did not notice, phew! 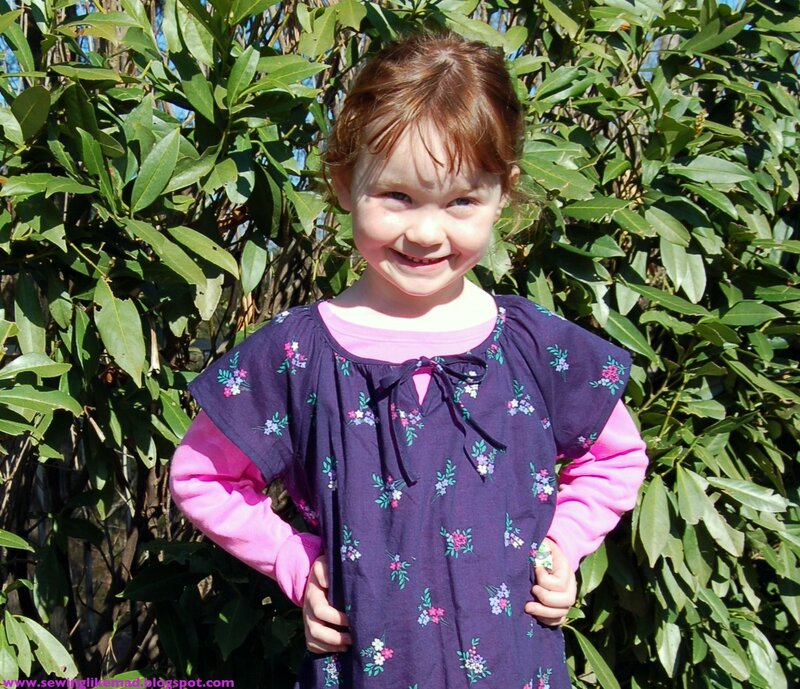 The dress is from Happy Homemade, vol. 5 by Ruriko Yamada. 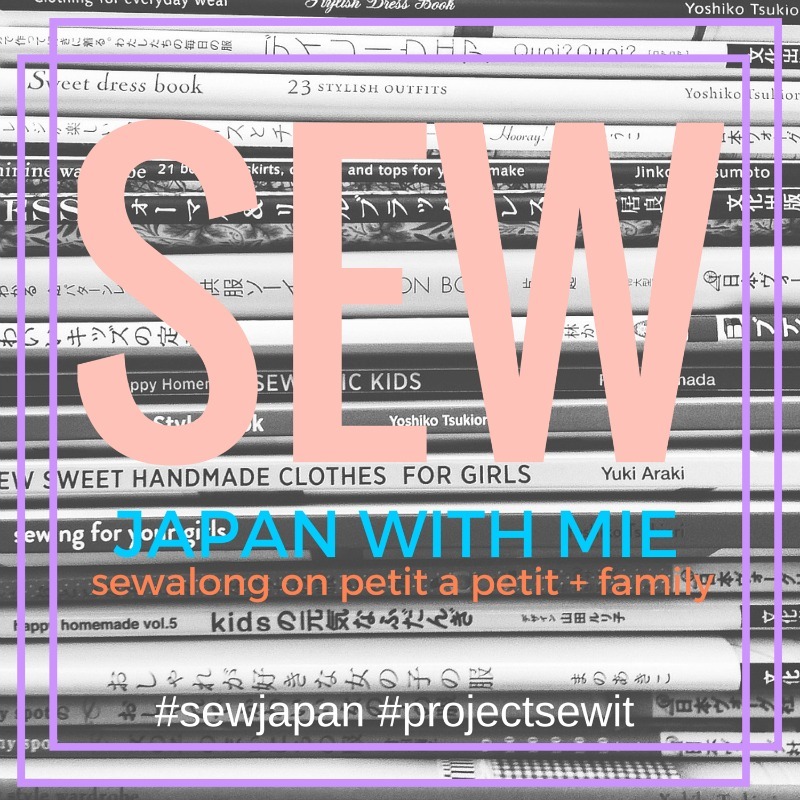 I am not going to give you all kind of tips for sewing with Japanese patterns because really you & mie and her guest bloggers did it SO well. There was no doubt that the process of making this dress went WAY easier because I had read that series. I knew the sizes, that I have to add seam allowance, where to look for cutting instructions and so on. The only things I don't remember reading in the series was how smart these patterns are build up. It might just be this book but I have a feeling it is not. 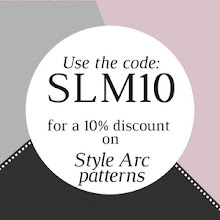 Many of the base patterns are the same just with length variations, with or without ruffles etc, so that means you can actually mix and match the styles without changing the patterns pieces. Clever! I also knew the models are roomy - this is a size 110 cm (W is 112 cm tall - ahhh, what a relief to work with cm again - America could you pleeeeaaase consider changing to the metric system ;-) But the fact that most tops and dresses are roomy is for me part of the charm and style of the Japanese patterns. The styles are very simple and to me the roominess is simply part of the design. And since I made this dress in a very thin - almost cotton voile type - fabric I resisted putting any type of elastic in the waist. I also 'resisted' to iron the dress before the photo shoot as you can see, ahem! A few close ups of the top of the dress. I can't wait to make more styles from this book. I loved that the sewing techniques they show with very clear illustrations were the same ones that I would have used if I made these styles. It always makes me trust patterns more when that happens. So maybe we are both wrong but at least we agree on it, haha. 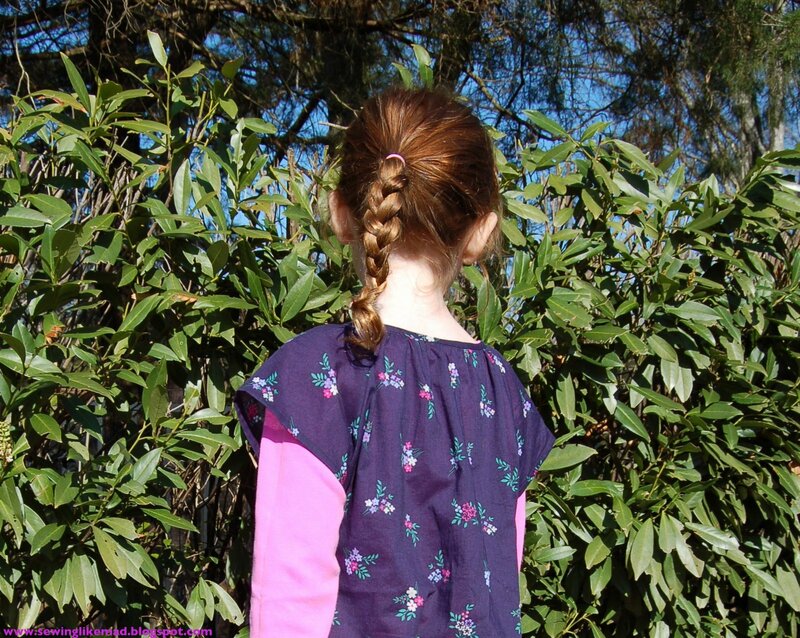 And a little sneak peak of the next post here on Sewing Like Mad. A leggings version of the Celine pants I knocked off in THIS post. I have plans of making a whole bunch (I already made another pair last night) and show them all in one post. Please consider following me with Bloglovin and/or Facebook, thanks. Congratulations on your first pattern. 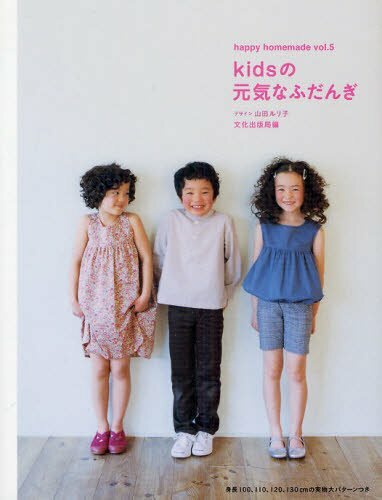 While those Japanese patterns look so cute on little kids baggy like that one is, the ones for adults look like giant potato sacks! 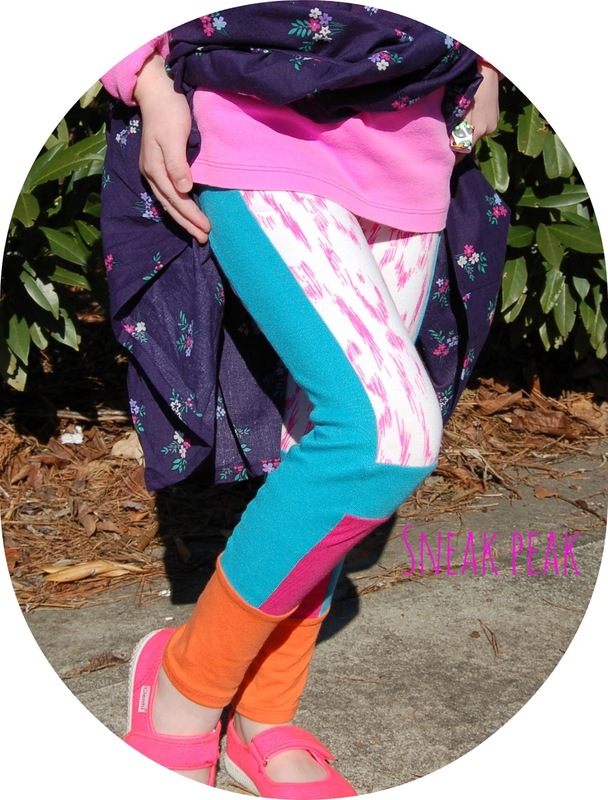 I know from experience I am loving those panelled leggings AND that purple floral fabric. Where did you get it?! It looks so great!! Congrats! And yes, America should definitely make the switch to metric - I just don't know who I should talk to about that . . . I don't know if I'd be game to use books in a language I can't read, although I suppose if there's lots of pictures it would be OK. You obviously had no problems, as you've sewn such a pretty dress, Mie. The little tie opening looks great, as do the ruffles!!! I don't have the guts for Japanese patterns! I'm in awe! Cute cute cute. Girl and dress, both. I know I sound boring. I always tell you the same thing. But, it's true! Have a great weekend and enjoy that dress!! Hi Mie, congrats! Yes, most of Japanese patterns are roomy. I usually check the measurement on pattern (the chest part) and tally it with my daughter's chest circ. She's 5.5 y.o (114cm), if I found size 110cm is still too big, then I used size 100cm and lengthen the bottom hem accordingly. You made nice dress and legging, they look comfy on Wilma, well done! KCW: (Day 2, 3, 4 & 5) Top and Shorts. KCW: Summer version of My Inner Grandma dress.